The real test of our new morning rules came this past weekend. All last week, June came into our room at 6:30 or later; one morning she even alarmed me by waking me and saying, “It’s 7:55,” when it was in fact 6:55, a perfectly reasonable time to wake given when we need to be out the door. But keeping herself quiet until 7:00 on weekend mornings proved more challenging than 6:30 on weekdays. On Saturday she was in our room twice between 6:00 and 6:30 and I had to go into the kids’ room another two times during that time period to tell them to quiet down. Finally, they went into the living room and read to each other, alternating pages from a Mercy Watson book (http://www.mercywatson.com/#books). At breakfast, after a stern review of the rules, I praised the kids for deciding to go into the living room, because it had gotten much quieter after that. “That was Beth’s idea. You should be complimenting her,” Noah admitted. (She must have given them this advice while I was in the bathroom.) So much for leavening the criticism with praise, I thought. Sunday morning wasn’t ideal either, as once both kids were awake at 6:15 they couldn’t resist talking to each other, and they only occasionally remembered to whisper. Under the old system, June was coming to our room and Noah was reading so they rarely encountered each other, but now that she’s staying in the room with him, they interact with each other and their interactions are rarely quiet. So we still have to figure out how to make the weekends work, but it’s early in the transition and I am not giving up on my vision of sleeping uninterrupted until 7:00 some Saturday or Sunday morning in the near future. I am ready to offer bribes, if necessary. And speaking of transitions, the garden in the back yard has basically started without us. 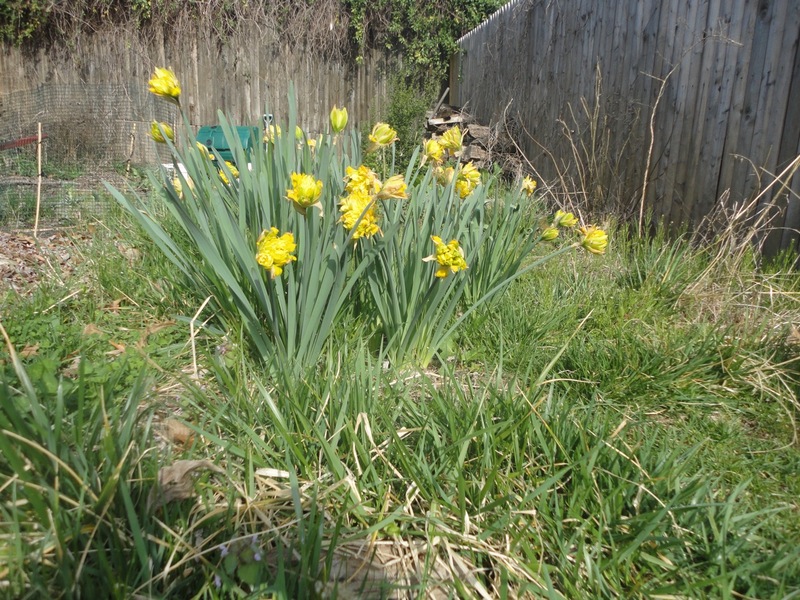 We have a cluster of daffodils there, an oddly frilly variety, which appeared for the first time several years ago, presumably planted by a squirrel. I’ve relocated some of the bulbs to the front yard, but I never manage to find them all. In fact it seems there are more of them there every year as I manage to separate the ones I find from too close neighbors, which makes them proliferate. 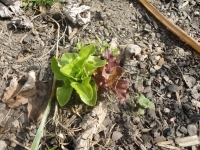 We also have broccoli and lettuce, both remnants of last year’s garden and the lemon balm and black-eyed Susan are starting to come back, too. 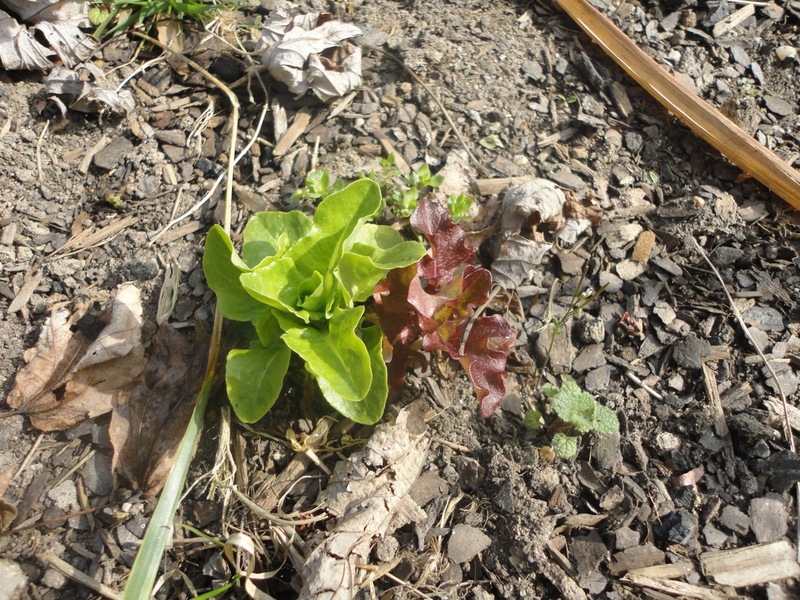 The lettuce just sprung up on its own. While lemon balm is known for its hardy and even invasive qualities and we’ve occasionally had black-eyed Susan come back, I don’t think of lettuce as a perennial; we’ve been growing it for years without ever seeing this happen. It must have been that the exceptionally mild winter spared the roots of a couple of the plants. 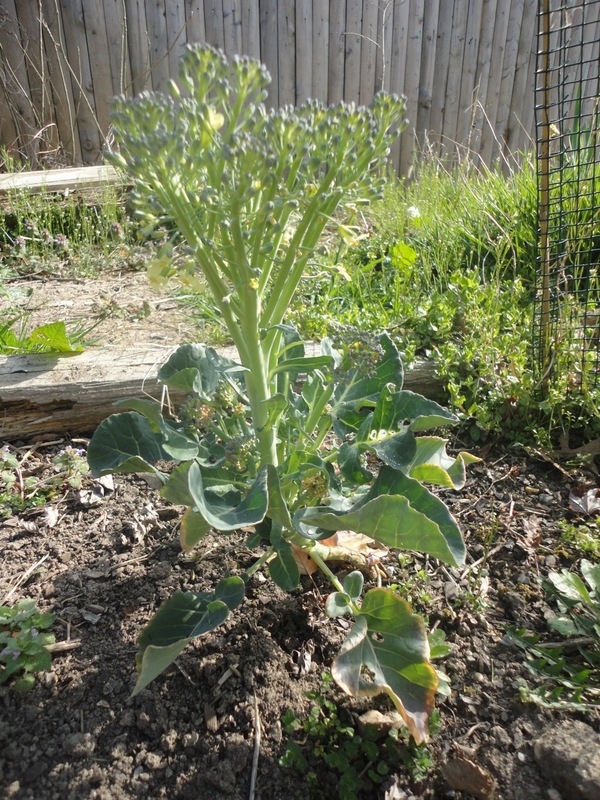 The broccoli I planted in late October. I bought six plants on a whim when I saw them at the hardware store. I knew broccoli can be a fall crop and I was sad about the garden being almost over and thought it would be fun to extend our growing season. 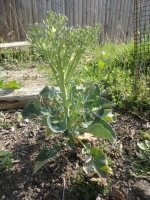 When I got home, I looked up some information about growing broccoli and discovered it was really too late to plant it in our area, but the plants looked sad and droopy and root-bound in their little pots and I thought they’d be happier in the ground, so I planted them, expecting they’d die before they produced any florets. They grew a little in the next month or so, and then they stopped, going into a holding pattern for much of the late fall and winter. They didn’t get any bigger and they didn’t die (except for one that gave up the ghost in January or February). And then they started to grow again, and all five remaining plants have produced florets. The biggest, most vigorous plant started to flower the other day so I harvested from it and the next two biggest. We’ll eat homegrown broccoli on spinach tortellini tomorrow night to celebrate the first day of spring. As we change seasons, I want to celebrate it all, the transitions we work to make happen and the ones that emerge unbidden, but no less welcome. This entry was posted in Gardening, Sleep and Naps by Steph. Bookmark the permalink.